[prMac.com] Scarborough, United Kingdom - Independent app developer eiiEntertains is announcing the release of a major update for their 2011 best-selling Christmas App for iPhone, iPod touch and iPad device users. Festive Fun boasts a rich mix of Christmas classics, like 'Days to Christmas', 'Christmas Jokes', 'Party Crackers' and 'Advent Calendar' along with new unique mini-app offerings such as 'Find the Present', 'Catch the Present' and the latest addition the arcade style 'Santa's Delivery'. Unbelievably its still free to download. 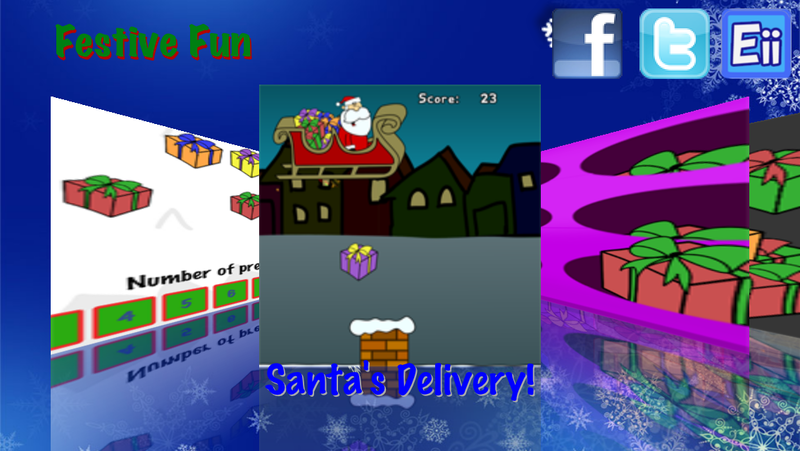 Festive Fun was originally designed to offer all of the small Christmas Apps that were appearing in one neat package, but after four incarnations it has grown beyond recognition. Festive Fun is for all the family to enjoy, each mini-app has been developed with the attention to detail and quality we devote to our other apps. Because it's a single package offering seven games, and six activities it saves nearly a whole page's worth of icons on your device. * Collect The Presents - How many presents can you collect before the time runs out? Festive Fun 1.3 is Free and available worldwide exclusively through the App Store in the Entertainment category. eiiEntertains is the mobile apps development arm of eiiConsulting Ltd which was set up in 2004 by Tim Teece to offer independent advice and software development skills. EiiEntertains aims to be a premier provider of mobile applications for the iPhone, iPad and IPod touch devices. Copyright (C) 2012 eiiEntertains. All Rights Reserved. Apple, the Apple logo, iPhone, iPod and iPad are registered trademarks of Apple Inc. in the U.S. and/or other countries.